One of Ireland’s leading manufacturers in veterinary pharmaceuticals, Chanelle, has teamed up with the Irish Cancer Society to raise funds by turning one of its products pink at this year’s Ploughing. This fundraising campaign was officially launched by Minister for Agriculture at this year’s National Ploughing Championships in Ratheniska, Co. Laois. Chanelle has launched a special pink promotion pack for its liverfluke treatment, Tribex 10%, with this fundraising campaign raising funds for cancer research. The company says it will donate €5 to the Irish cancer society from every special pink pack sold. It says that these much needed funds will be used to support cancer research and essential services including information, advice and support services for families throughout the country who have been affected by cancer. The product, Tribex 10% is used by farmers to treat liverfluke, a common parasitic disease of both cattle and sheep. The special pink 7.2L promotion pack, recently approved for dairy cows, will treat 100 cattle or dairy cows for all three stages of liverfluke. Speaking at the launch, Veterinary Sales Manager for Ireland, Michael Holohan said that the company is honoured to support such a worthy cause. 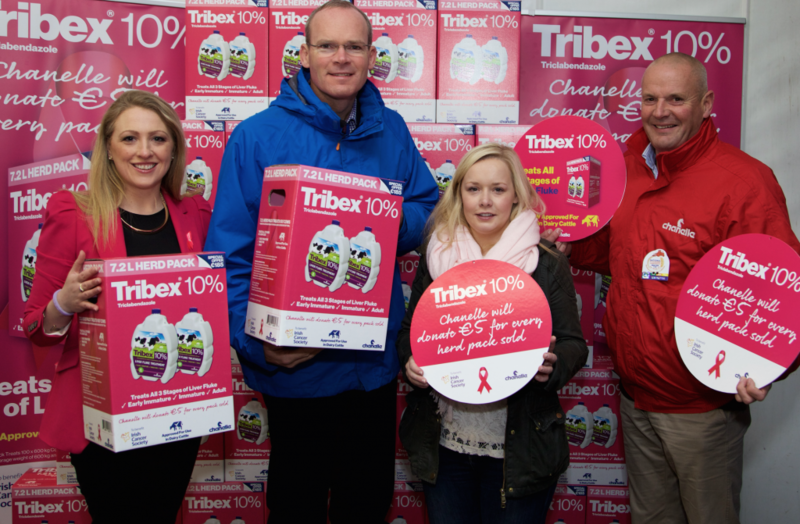 Farmers can support the initiative by purchasing Tribex 10% Pink Pack in their local Co-op, veterinary practice or merchant store where the product is now on sale. Chanelle is an Irish owned company based in Loughrea, Co Galway. The company employs over 300 people at its R&D and manufacturing facility in Loughrea.